Thousands of children are anticipating a hunt for candy-filled eggs on Sunday. My boys, 8 and 5, shaking their heads in wonderment, that some people think it’s all about the candy. We are privileged to know Who is the true Treasure of Easter. Easter means more than decorating with budding white lilies and wearing pretty new clothes to a sunrise service. Easter is more than dutifully looking back at something that happened nearly 2,000 years ago. It is even more than just celebrating the resurrection. So much more. When Jesus hung on a cross near Jerusalem, He was alert. He wasn’t accusing those who tortured Him. 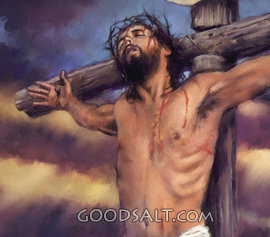 For you see, He climbed onto the cross by His own choice. Yes, He had the power to come down and kill all those who afflicted Him. Yet, He wanted them to nail Him there, more than His desire not to suffer. And as He suffered, His excruciating pain didn’t prevent Him from remembering why He was there. It wasn’t the vast collective crowd of sinners (all people who will ever exist) in His mind. He was thinking of individuals. He was thinking of Sara. Me. He knew about my sins. That I would reject Him. Jesus knew that I would at times struggle with respecting my body, His temple, with the sin of gluttony. He knew that sometimes I would hurt His cause with my words and actions. He took upon Himself the iniquities of worry and fear that would drain usefulness from my life, until I learned His lessons about trust. Every sinful thought and attitude that has crossed my mind. He knew about it then. And it added to His pain. He bore it all out of His incredible, matchless love for me. Sara. He loved me then, and He loves me now. He yearns for me – a rebellious, doubting, fickle woman! How then can I rejoice over His resurrection without first kneeling again before the cross, looking at His body battered beyond recognition because He loved me? As I lay in my bed last night, confronted by the truth of the power of His gifts, asking God to forgive me for my worry and fear, I found another gift. While He was dying, it wasn’t just my name He was thinking of. He was thinking also of all those whose sin has hurt me and those I love. He agonized, grieved, and ached over these sins (much more than I ever could). Jesus understands my pain! And He kindly offers the solutions, the balm, the re-creation, and the complete forgiveness of all that is ugly in my life. The pain I feel in this life, from my sins and sins committed against me, is personal. (I feel guilty saying so … after all, many people have suffered much more than I.) 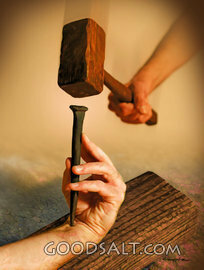 Yet, the truth of the atonement Christ made on the cross, is also personal. And it is the same gift offered to you! Christ’s death was PERSONAL for every person. Sunday will be a time of great celebration and victory! Because He lives, we too shall live! But, until Sunday, let’s take time for the cross. If you would like to learn more about what Jesus has done for you, click here.